and the underlying constructs influencing today’s schools. 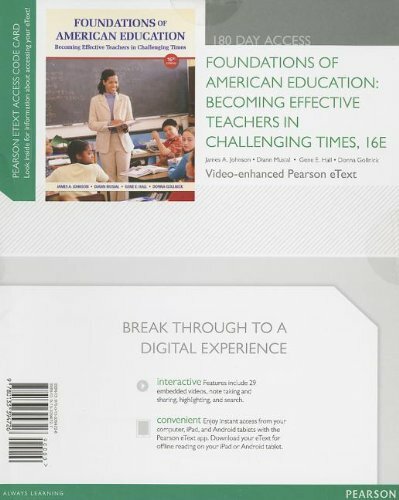 The book includes comprehensive coverage of recent trends and issues in schools, the emergence of Common Core State Standards, RTI, and the continuing emphasis on assessment. World Health Organization (WHO) and ProWorld Service Corps on international public health projects, he is a regular delegate to the World Health Congress and a long-term active member of the American Public Health Association (APHA) and the Association of University Programs in Health Administration (AUPHA). Dr. Johnson has been an invited lecturer at top universities around the globe, has served on many boards (including for AUPHA), and currently serves on the Advisory Board of the Joint Africa Working Group, the Board of Directors of the Africa Research and Development Center, the Advisory Board of the Center for Collaborative Health Leadership, and the Board of Advisors for Health Systems of America. He is also actively involved in the development of a Center for Health Systems and Policy Research at CMU. Dr. Johnson completed his Ph.D. in health policy and administration at Florida State University and his M.P.A. in health care administration at Auburn University. accredited. He is also internationally known for his research on the change process in schools and other types of organizations. He is the lead architect of the widely used Concerns-Based Adoption Model (CBAM), which organizational leaders and staff developers employ in studying and facilitating the change process. In addition to coauthoring the last six editions of this text, he is coauthor of Implementing Change: Patterns, Principles and Potholes, Second Edition (Allyn & Bacon, 2006), and The Joy of Teaching: Making a Difference in Student Learning (Allyn & Bacon, 2008).Donna M. Gollnick is senior vice president of the National Council for the Accreditation of Teacher Education (NCATE), where she oversees accreditation activities. She is also past president of the National Association for Multicultural Education (NAME) and is a recognized authority in multicultural education. In addition to her work in teacher accreditation, she has taught in secondary schools and coauthored five editions of this text. She is also coauthor, with Philip C. Chinn, of Multicultural Education in a Pluralistic Society, Eighth Edition (Merrill, 2009) and coauthor of The Joy of Teaching (Allyn & Bacon, 2008).